Teleconference book signing and talk, Saturday June 12 at 4:00 PM Pacific Daylight Time - 5:00 PM (1:00 PM Eastern and 8:00 AM June 11 UK). 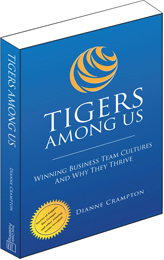 Author, Dianne Crampton, will be sharing how TIGERS came about, how culture split and team conflict frustrates leaders who could have truly great companies, and stories from our 4 case studies - Tribe, Inc, Dos Gringos, Zappos and 4Refuel. Participants will be able to e-mail their questions during the event to make this a very rich dialogue and an exceptionally worthwhile event. Should you choose to add TIGERS Among Us to your reading list - there will be no postage and hancling fees and your copy will be autographed and delivered to your door.